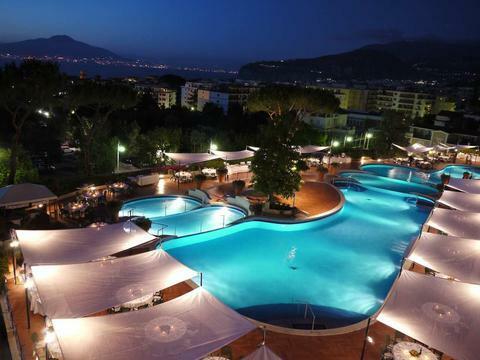 Located on the 2nd floor of Hilton Sorrento Palace the walk-in rooftop pool offers panoramic views of the Sorrento cityscape, the Bay of Naples, and Mount Vesuvius. The outdoor pool consists of 6 connecting pools and features 200 sun loungers, large sun umbrellas, a ceramic tile pool deck, sculpted topiary, citrus orchids and a pool side bar and restaurant known as La Pagoda. The open air bar and restaurant serves a variety of indigenous cocktails as well as a menu of pizza, wraps, and fresh seafood. The seasonal pool is open from April to October and is open from Monday through Sunday 9:00 a.m. - 6:00 p.m. During the winter months an indoor pool is available.